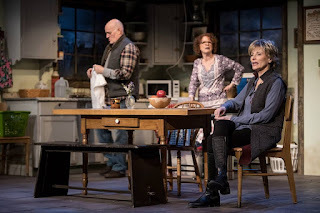 The Jungle Theater opened an intense three-person play a week or so ago, and our bloggers were impressed by this first post-Broadway production of THE CHILDREN by Lucy Kirkwood. Read on for the sound bites and click the links for full reviews. "Everything about this play is impeccable, from this very specific design that transports the audience to a seaside cottage after a nuclear disaster, to the three-person cast of beloved veterans of stage and screen, and everything else that allows this magic to happen. Get yourself to Uptown to see this brilliant work of theater that will leave you contemplating life for days to come." "We were all blown away by the stellar performances of the cast. All of them have had extensive careers on stage, film, and television. Their interactions with each other gave us the feeling that they genuinely had life-long connections to each other. It felt like we were sitting in the room with them witnessing their interactions." "The Children is a play that defies easy description and leaves a lingering memory, much like the actions of the characters in the show. It is a pleasure to see a trio of seasoned, skillful actors share the stage on equal footing, and the fact that it was so striking to note an absence of anyone under 50 on-stage made me simultaneously thrilled to see such genius and sad that it's so rare to find in culture at large." "This play is powerful, thought-provoking, incredibly timely (what with the government shutdown, repeated reports about the effects of global warming and changing temperatures here in Minnesota, and general continual fear/dread that seems to have become normalized in society), and one that deserves lots of discussion and pondering over afterwards." "The Jungle has entered the 2019 theatrical year with no reservations, with a play that feels small but asks some very big questions." "Kirkwood has masterfully written a beautifully layered piece of theatre that takes a very real and relatable issue in this current political climate to the forefront of our thoughts."